NetNewsLedger - Leadership structure for the Wet'suwet'en territory at the heart of pipeline gridlock issue in B.C. Hear that? That’s a hammer hitting a nail. The largest issue blocking Canada’s relationship with Indigenous nations, by far, is jurisdiction. Simply put, the 143-year-old Indian Act imposes one idea of government on First Nations, while Indigenous nations have their own. 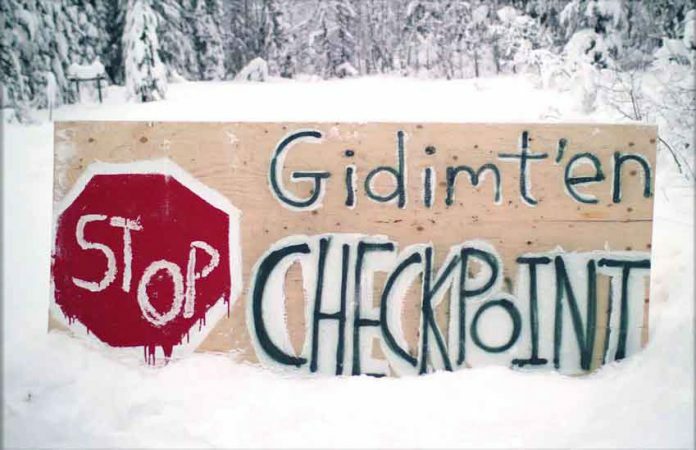 The problems of having two different types of leadership was laid bare the past few weeks, during arrests over the $40-billion Coastal GasLink pipeline in northwestern B.C. The Wet’suwet’en (people of the Wa Dzun Kwuh River or Bulkley River) have a traditional governmental system spanning families, and territories called clans. For as long as they have existed, the Wet’suwet’en are governed by five traditional clans with hereditary leaders. At the same time, there are “First Nations” amongst the Wet’suwet’en and each have Indian Act chiefs who are elected by status Indians and purport to represent their interests. Coastal GasLink has negotiated sharing agreements with all 20 Indian Act chiefs along the pipeline’s route — but not the hereditary chiefs. The hereditary chiefs say they were not consulted and are “adamantly opposed” to the project. Their supporters have erected camps blocking the pipeline’s route, resulting in arrests and ongoing conflict. The question of who has authority to speak and make decisions on Wet’suwet’en territory is at the heart of this issue. According to Bennett, “It’s up to each community to determine’s it’s leadership structure.” But this hasn’t stopped the federal government and its corporate partners from proceeding. The ongoing conflict is a microcosm of forthcoming battles throughout Canada. For years, conflicts over who has jurisdiction over Indigenous territories have led to battles in boardrooms and courtrooms but now the line appears to be drawn in B.C. Much of British Columbia is “unceded” territory: lands Indigenous communities have never agreed to share under any treaty. Canada claims to assert all lands in B.C. are its due to the 1763 Royal Proclamation and the “doctrine of discovery,” but these principles are constantly challenged in court by Indigenous nations — and often proven illegal and unjust. Even Vancouver is claimed by the Musqueam, Squamish and Tsleil-Waututh First Nations, a fact Vancouver city council has recently recognized. This opens the door to redress and reconciliation, but who does the federal government speak to when trying to settle claims: Indian Act chiefs of traditional leaders? There seems to be little time or patience left in this federal government. B.C. nations are told, on one hand, their leadership will be respected, but when they turn to discuss who that will be, trucks and bulldozers move in. It’s like the federal government has set the table, made the rules, decided who can play, and then deals the cards. First Nations, if anything, get to choose if they sit down, and then bet on the hand. According to Indigenous governance researcher Russ Diabo, there are approximately 150 First Nations currently negotiating with the federal government on land claims and “self-government agreements.” At the heart of these is determining how a First Nations will operate as a government and if Canada will agree on how the two sides will interact. It’s like a dependent person asking for permission to be independent — it doesn’t add up to a lot of independence. Every once in a while, an Indigenous nation seems to win at this game. The Manitoba Metis Federation claims it is the “government” of the Métis people in Manitoba. The federal government is showing signs of agreeing, providing the MMF with $154.3 million to become a “self-governing Indigenous nation,” with details to be negotiated in future meetings. Notice the disclaimer: “In some ways.” The Métis aren’t included under the Indian Act, so perhaps their rules are still being written. The bottom line is while there is a murkiness in Indigenous leadership and who speaks for whom, the federal government and its partners are proceeding with plans anyways. Indigenous nations play a dangerous game with the Indian Act. Stay committed to your traditional lifeways that have served you for millenia and resulted in leaders such as Louis Riel, Tecumseh, Mistahimaskwa (Big Bear), and Thayendanegea (Joseph Brant) — a road that seems to lead to more conflict. Or adopt an imposed, foreign system, but one the federal government recognizes and most easily works with Canadian policies and practices. It’s a gamble. And the problem with gambling is the house always wins.